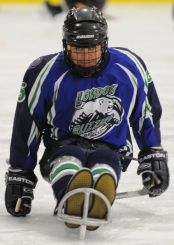 About Us The London Blizzard Sledge Hockey Club (LBSHC) was formed in 1997 as a form of recreational therapy for children with disabilities. 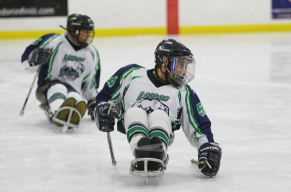 Our mission is to continue to expand the sport and make sledge hockey accessible to as many physically challenged individuals as possible. The LBSHC has grown to encompass both male and female players from the ages of 7 to adult, playing on junior and intermediate level teams. We are always looking for more players. Our goals are to make the sport as exciting and personally satisfying as possible to every player through the development of skills, team building and social interaction in an enjoyable and fun atmosphere. Our regular season includes weekly practices, scheduled home and away games, and participation in tournaments. 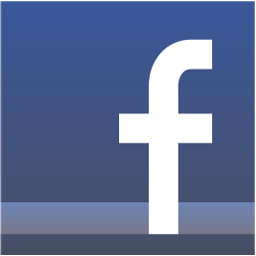 We hold social functions during the year, fund rasing events and participate in exhibits and demonstrations. Our objectives are to create awareness and to involve the community at large through volunteers and the support of businesses. The Optimist Clubs of London and area have partnered with us and provide volunteer and financial support. Youth groups such as Girl Guides and Cubs have visited, helped and tried the sport. Sponsorship funds from small businesses and individuals have helped to cover ice and equipment costs.